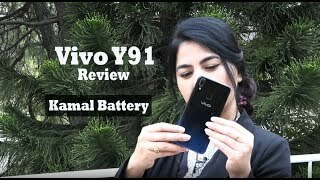 Vivo has launched a budget smartphone Y91 in Pakistan. This mid-range device is a new addition to the popular, youth-oriented Y series which comes with 64GB ROM and a massive 4030mAh battery, so you can keep using your phone without any worries. Vivo Y91 features a trendy and striking design – the new Halo FullView™ Display paired with Starry Black and Ocean Blue colors, all packed within a curved 3D body to provide an uninterrupted and immersive user experience.